Ideally located for business people and tourists alike, just half a mile west of the city centre, the hotel is within a few minutes walk of the Scottish Exhibition & Conference Centre with Glasgow Art Galleries and Museum, Glasgow University and Museum of Transport all on our doorstep. Opposite, Kelvingrove Park offers picturesque walks, tennis, bowling and riverbank paths for the keen jogger. We are also well positioned for events at the Kelvin Hall International Sports Arena. 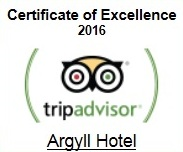 A warm welcome awaits you at the Argyll Hotel time and time again. Affectionately known as your ‘home away from home’ to many of our regular guests, the Argyll Hotel offers first class accommodation, Glasgow hospitality and traditional Scottish Fayre. We cater for all sizes of party from the single business user to parties and weddings. To see more of our rooms and facilities used by our guests follow this link. To read what our guests have written about us in our guestbook and online about their stays at the Argyll Hotel.